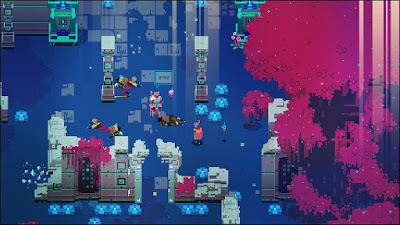 Take one part open-ended Legend of Zelda-style adventure, mix it with one part Dark Souls-style difficulty and lack of hand-holding, and then color it with a neon highlighter set, and that is pretty much Hyper Light Drifter. This throwback to retro 16-bit action RPGs brings some new tricks to the table as well, and when you put it all together it is a pretty darn special experience. It might not appeal to those that are easily frustrated, however, as it is very difficult, but putting in the effort to “git gud” definitely pays off. 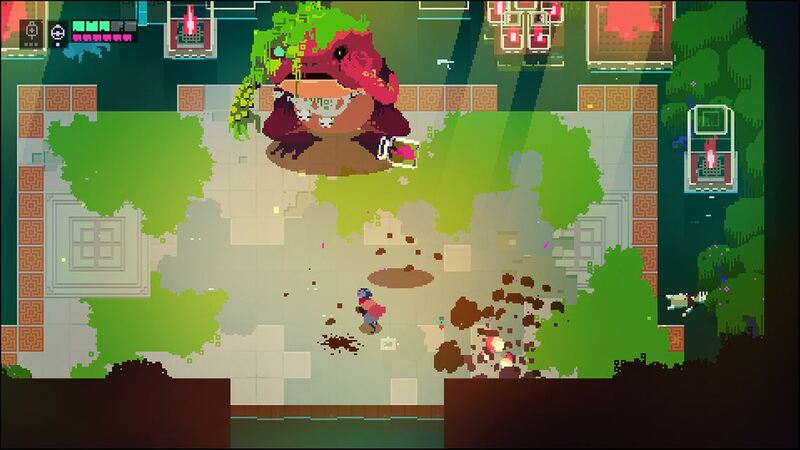 See our full Xbox One Hyper Light Drifter review right here. 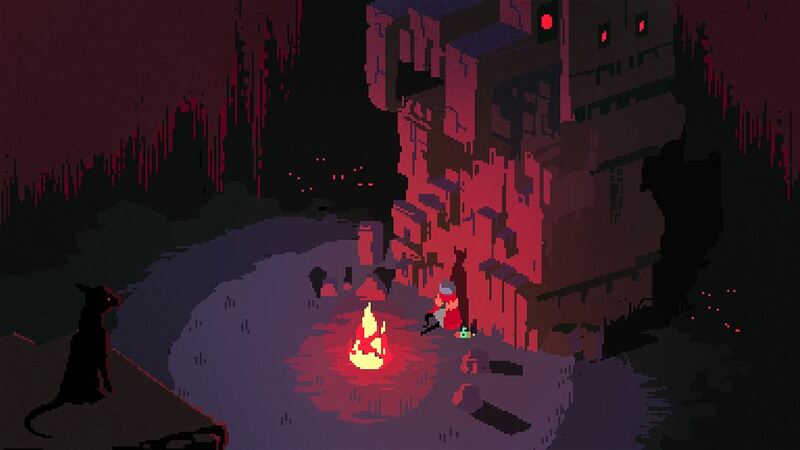 Similar to the original Legend of Zelda or Dark Souls, Hyper Light Drifter plops you into its world with no real context as to what you’re supposed to do or how to do it. You quickly discover a town with a compass in the center pointing to the four cardinal directions, though, so you set off in one of those directions to see what you can see. It turns out that each quadrant of the world has its own set of keys and items and a boss, and by defeating the boss of each area you open up the path to the final showdown. Why you need to fight them, however, remains a mystery. In true oldschool adventure game form, though, you don’t really need a reason to explore and fight. You explore because you simply want to see what’s out there. And you fight in order to protect yourself. It is as simple as that. 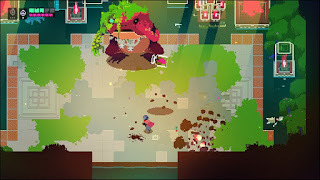 Hyper Light Drifter is played in a similar ¾ top down perspective as the classic Zelda titles and other 8 or 16-bit RPGs. Gameplay is fairly simple with simple sword attacks, guns with different shot types, and a dash ability that lets you cross gaps or simply dodge around enemy attacks. That simplicity is deceptive, however, as each enemy you encounter requires different strategies and techniques in order to defeat them, so learning how to effectively use all of your abilities is vitally important. Hyper Light Drifter is also really, really difficult, too, as even the basic enemies can hit you really hard and kill you extremely easily. It is very similar to Dark Souls, as I already mentioned, but it is perhaps closer to Bloodborne as the key to victory is usually to dodge in, get a hit, and then dodge out to safety before an enemy can counter. This gameplay style keeps you on your toes and requires absolute concentration and can honestly be really, really frustrating when you die repeatedly in the same room. It never feels unfair, though, as pure skill on your part can overcome any obstacle the game puts in front of you. Learning enemy patterns, doing a better job dodging, being more patient, and then hitting the enemies hard when you have an opening are all up to you and your skills, and I love it. Even when the game did frustrate me and I got mad and quit, it is one of those experiences that get its hooks into you so you always come back. I’d come back to the same sequence or boss fight an hour later and easily beat it, which is always a satisfying feeling. 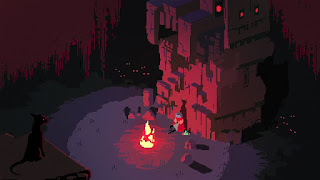 Something interesting about Hyper Light Drifter is that you don’t really ever get stronger or more powered up over the course of the game in the same ways you do in other titles. You can buy new sword attacks, you can buy grenades, you can carry more health packs, and you find better guns, but you don’t ever “level up” to do more damage and turn the tides in your favor. And even though you’re not leveling up, the enemies you fight do get more powerful as the game progresses. What does happen instead is that your skills as the player improve. You don’t need to be able to absorb more hits or deal more damage on a purely stats-based level because your increased skill level means you can hit harder and faster and be better without arbitrary numbers telling you so. I love games like this that respect and reward your skills. As much as I do respect the desire to keep things mysterious and not hold your hand too much, I do think the game would have benefited from a little direction and explanation. They really don't tell you how to do anything or how anything works or what anything does, and a little nudge in the right direction would likely help ease the frustration a little bit. You do figure most of it out, of course, since the game is incredibly well designed, but a little hint here or there wouldn't hurt. 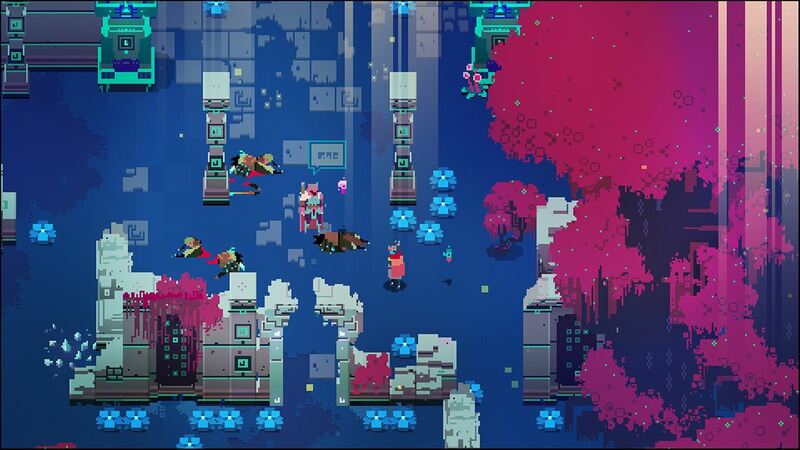 Hyper Light Drifter not only plays fantastically well, it also looks amazing too. It has a very unique aesthetic that is at the same time sharp and detailed, but also created with a clear intent to be clean and simple. The world is made up mostly of simple shapes and flat colors, and the character and enemy designs are as simple as can be, but everything is so clear and easy to recognize that the minimalist style works amazingly well here. And I just love the use of bright – often neon – colors to really make the world pop. The sound is also really well done with great sound effects for combat and a truly incredible soundtrack. All in all, Hyper Light Drifter is a truly great game that is among the best oldschool action / adventure titles on Xbox One. It is a love letter to not just retro games like the Zelda and Metroid series, but to From Software’s modern Souls games as well, and that combination comes together in an expertly crafted experience that is absolutely awesome. It has clear inspirations, but unlike a lot of other indie games, it doesn’t get lost in the shadows of the games it tries to emulate and is able to stand on its own as something truly new and unique. Be warned that it is very difficult and if you are easily frustrated it might not be for you, but it is also very rewarding when you learn to play it well and that tangible feeling of your skills improving is very satisfying if you’re willing to put in the work. I do hope you’ll play it. Hyper Light Drifter is awesome.